In a packed university conference room, biologist Randy Brown spoke of chinook, the fatty king of far-north salmon. “It’s more than just a fish, it’s a culture,” Brown said to the Fairbanks crowd, many of them Alaska Natives. Brown is the lead author on a paper in which he documented all the known Yukon River chinook salmon spawning beds in the U.S. and Canada. The fish biologist at the U.S. Fish and Wildlife Service and his colleagues spent years reading papers and speaking with people. 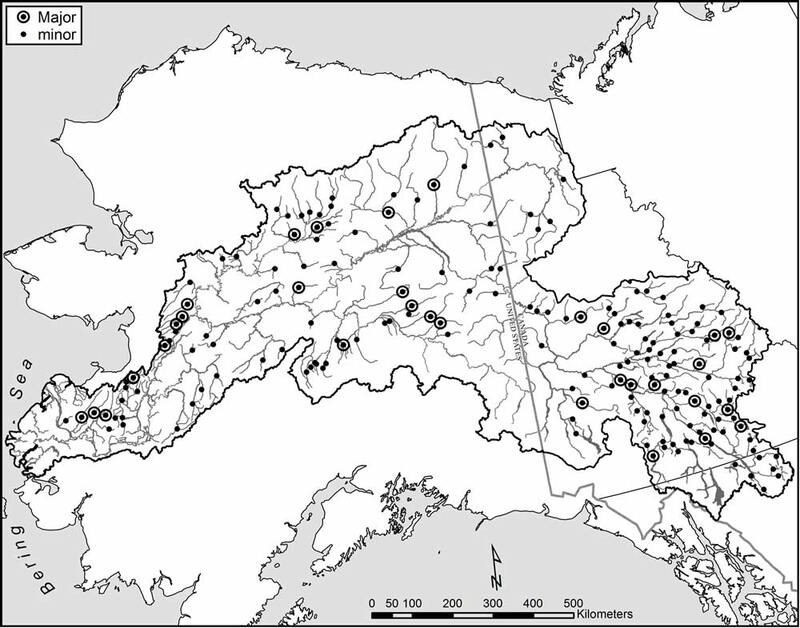 They created a map of where Alaska’s largest and rarest salmon return to spawn. Chinooks, also known as kings, begin life as fertilized eggs in the gravel of 183 waterways of the Yukon River basin: 79 in the U.S. and 104 in Canada. Some of the fish tuck into tributaries less than 100 miles from the Bering Sea; others travel 2,000 miles farther, swimming across the border and deep into Canada’s Yukon. The Journal of Fish and Wildlife Management published Brown’s study. Salmon arrive at many crossroads during their migrations back to birth streams. One third of all the water in Alaska proper drains into the Yukon. The basin receives water from 330,000 square miles of mountain and muskeg that take up as much space as Turkey. The Yukon is not the longest river in America; it is third, behind the Mississippi and the Missouri. But king salmon nose their way up neither of those. More than 100 million people live in the Mississippi drainage; 15 million more within the Missouri’s watershed boundary. Fewer than 200,000 people reside in the catchment of Alaska’s largest river, most of them in Fairbanks and Whitehorse. Of the thousands of tendrils that carry water to the Yukon River, the most popular chinook birthing grounds are surprisingly close to the only place resembling an urban center: Fairbanks. Brown and his co-authors based their stream assessments on histories of fish counted by people standing in towers or on wood platforms above the chutes of wiers, fly-overs in which observers counted fish from aircraft windows and “gray” sources, such as people mentioning seeing chinooks during studies of other creatures. Other major Yukon chinook spawning areas include the Andreafsky, Nulato, Gisasa and Tozitna rivers in Alaska, and the Klondike, McQuesten, Big Salmon, Ross and Nisling rivers in Canada. Brown and his colleagues documented a few streams that had not been reported as chinook spawning waters before, such as the Sulukna River, a tributary of the Nowitna River. Last year, biologists counted 263,014 returning Yukon chinooks passing a sonar counter near the village of Pilot Station, not far from where the river meets the ocean. That followed counts of 176,898 in 2016 and 146,859 in 2015. Brown has a blood-and-slime connection with Yukon River chinooks. Since 1976, he has wrestled them from nets in an eddy of the big river at his fish camp. Before starting on his path as a biologist in the 1990s, he lived in the country between Circle and Eagle. Each summer, he and his wife Karen Kallen-Brown and later their sons Jed and Gabe caught dozens of chinooks as the fish arrived in mid-summer. The Browns grilled the fish fresh from the water or cut the fish in ruby strips to dry over spruce poles. They preserved some in glass canning jars. The fish, some more than 20 percent fat as they entered the river, were a mouth-watering addition to meals harvested in the hungry country of middle Alaska. “We love our fish,” Brown said at his presentation. During an interview a few days later in a room overlooking the frozen Tanana River flats, Brown imagined Yukon River chinooks out there beneath the quiet ice of the Salcha, Chena and Goodpaster rivers. Those salmon babies are tiny: wriggling fry still attached to egg sacks in gravel, and one-year-old fish, known as parr. Long as your pinkie, tiger-striped parr are wedged between pebbles on river bottoms, not moving, not eating, waiting until river ice thunders and floats downstream in May. “Just after breakup, they’ll blast out of the Tanana,” he said. Those fish will veer left at the village of Tanana and head 1,000 miles to the ocean. The lucky ones will reach the Bering Sea by June or July. There, they will eat and grow and, in a few years, transform into 25-pound torpedoes. One summer day, following some unknown signal, they will turn, leaving salt water to follow the call of the Yukon. I am landlocked between the Mississippi and the Missouri Rivers with nary a salmon to be seen, except in grocery stores. Interesting reading. Thank you very much.
? If Pebble mine goes through and destroys salmon spawning creeks for 50 years, is that the end of the salmon fishery or can salmon adjust and spawn somewhere else? Thanks for the link, Dennis. Good to know Murkowski stands by protocol for some congressional decisions. Forgive me, I know it isn’t just the loss of salmon, but, the lives and cultures of numerous native people is also at stake. Mining in the Yukon Territory, Canada is a booming industry. The hunt for gold is in the heart of the Chinook spawning grounds. Alaska has a unique international partnership for Chinook conservation, my concern is will the quest for profit supersede the salmon treaty.